Barack Obama returned to Selma, Alabama, last Saturday, with an updated version of his speech on race delivered eight years ago, during another commemoration of the 1965 march over the Edmund Pettus Bridge. Back then, presidential candidate Obama told the crowd at Brown Chapel AME Church that Blacks had already come “90 percent of the way” to racial equality. He was implicitly predicting that the election of himself as the first Black president would propel African Americans to 100 percent equality, completing the journey and marking the end of racial politics in the United States. It was a bald-faced lie, by any statistical measurement. Blacks had never earned more than 66 cents on the white dollar, and would fall much further behind before Obama set foot in Selma, again. Catastrophically, Black median household wealth would collapse to one-twentieth that of whites under his watch. A year after his first Selma speech, the Rev. Jeremiah Wright affair would force candidate Obama to give a widely acclaimed presentation on race, in Philadelphia. Obama trashed his former pastor for harboring a “profoundly distorted view of this country — a view that sees white racism as endemic” – a term defined as “belonging or native to a particular people or country.” He denied that racism had ever been endemic in the U.S.
Last weekend, Obama returned to the subject of endemic racism. “What happened in Ferguson may not be unique, but it’s no longer endemic, or sanctioned by law and custom; and before the Civil Rights Movement, it most surely was,” he told the huge throng in Selma. Obama now admits that racism had once been endemic to the country but, apparently, the marching of Black feet had stamped it out, so that it is now limited to Ferguson-like localities. “We do a disservice to the cause of justice,” he said, “by intimating that bias and discrimination are immutable, or that racial division is inherent to America.” How dare they malign the world’s first apartheid nation, a country that rose to superpower status on stolen land and labor, in such cruel fashion! Obama tries to split the U.S. historical time-line in two: Before Civil Rights (BCR) versus After Civil Rights (ACR) – an exercise that allows him to dismiss today’s racial realities by dumping the endemic variety into the era before voting rights and scraping the leftovers into benighted places like Ferguson, Missouri. 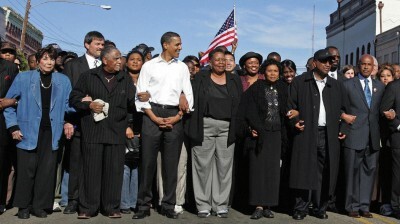 Obama’s 2015 Selma paradigm meshes with his 2007 fiction that Blacks had already traveled 90 percent of the road to equality and were one presidential vote away from completing the process – which is another way of saying that the Democratic Party will set you free. The president’s reasoning also gives aid and comfort to the majority of whites, including youngsters, that now believe white people are the most discriminated-against class in America. If endemic racism has been all but eliminated and Black people have already achieved near-equal status, then Black protestations to the contrary are baseless and maliciously racist in intent. The real problem, therefore, is “reverse racism”: that Black Lives Matter too much. As anti-racist white scholars Paul Street and Tim Wise warned in the run-up to the 2008 election, many whites interpret Obama’s ascension as having removed any residual legitimacy from Black complaints. Obama’s rhetoric and behavior buttress that twisted worldview. For Obama and Holder, the routine killing of unarmed Blacks by police is “tragic,” but not evidence of anything endemic in American society – certainly, not something for the U.S. Justice Department to worry about. The division of U.S. history into pre- and post-Selma eras is also a way of delegitimizing the struggles that continued after passage of civil rights legislation: the battles against domestic and global social injustice and the fight against what the Black Panther Party for Self Defense called the police “army of occupation.” Five years after the events on the Edmund Pettus Bridge, the national policy of mass Black incarceration had become fully operational. Over the space of two generations, an entire people would be criminalized by the Mass Black Incarceration State – what Michelle Alexander calls “The New Jim Crow” – a system so pervasive and unremitting that one out of every eight prison inmates in the world is now an African American. This is the system that Obama and Holder so vigorously defend. Maybe. And, if someone had said, back in 2007, when Barack Obama spoke at Brown Chapel AME Church, that he would surpass George Bush in fomenting war and chaos in the world, including a 7-month bombing campaign against an African country; exempt “too big to jail” bankers from all criminal penalties; pass legislation effectively nullifying due process of law (except, apparently, for killer cops); and subvert public education in favor of privatized charter schools – in short, that the first Black president would become the “more effective evil” – few would have believed it. But now we know. It is a bridge that Black people had to painfully cross, to arrive at the other side of the illusion.